Cosmic Eclipse Slot- A New and Exclusive Slot Release from NetEnt now playable at Betsafe Casino! 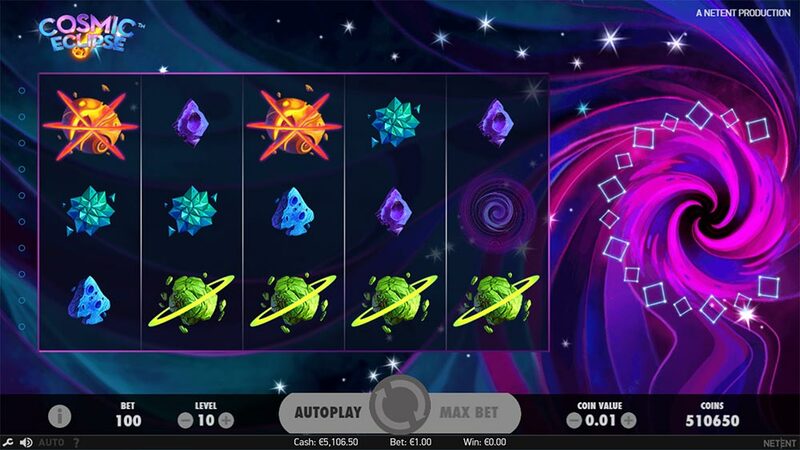 Greta news for fans of NetEnt slots as the Betsson group of casinos which includes Betsafe, Betsson, Mr Smith and CasinoEuro has recently added a brand new and exclusive slot titled Cosmic Eclipse. 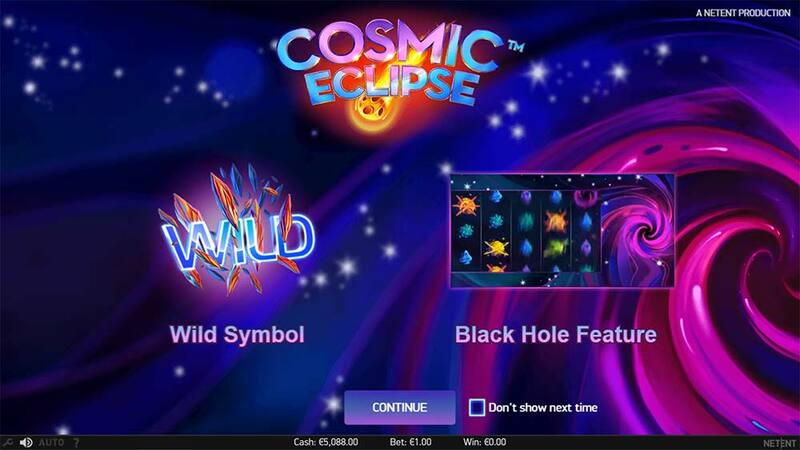 Cosmic Eclipse is a 10 payline asteroid/space themed slot that uses just 10 paylines and relies heavily on a special Black Hole Feature which is triggered by a special Black Hole symbol only found on reel 5. An asteroid symbol is then selected at random and on subsequent re-spins, these are then collected in the Black Hole (seen to the right of the slot) in a special Collection Meter with up to 15 matching symbols (a full screen) being abled to be collected during each feature. 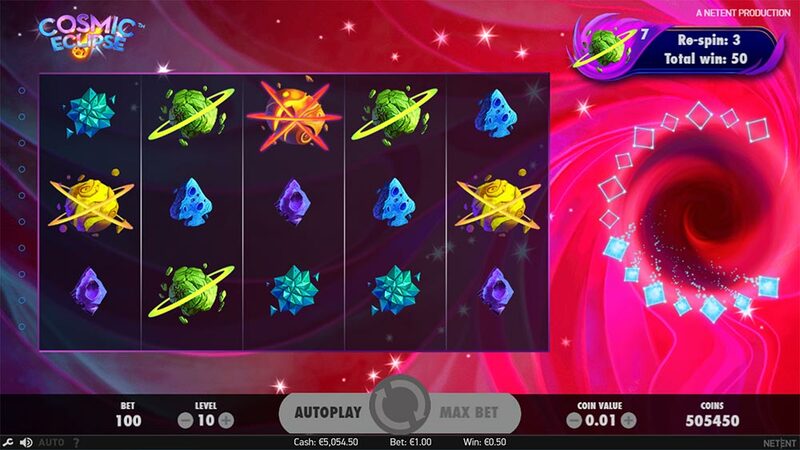 This respin and collection mini-feature continues until no more matching symbols land on the reels, this results in the asteroids then spewing back out from the Black Hole to create a variety of winning combinations on the reels depending on how many have been collected and the position they land in. Collect all 15 symbols and you will get a full screen of matching symbols or in short a Big Win! 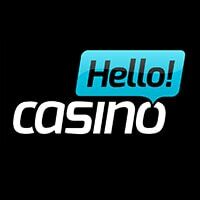 As mentioned earlier this is currently an exclusive slot release from NetEnt for this group of casinos so you will not be able to play it elsewhere for several months at least depending on the exclusivity period. The Black Hole Feature is activated when the special Black Hole symbol lands in view on the 5th reel, a random symbol is then chosen and collected into the Black Hole along with any of the Wild symbols. Re-Spins of the reels are then granted where you can collect further matching symbols, the re-spins end if no more matching symbols land in view and thankfully all of this collection process is tracked to the right of the slot in a special collection meter that lights up your progress between each re-spin. 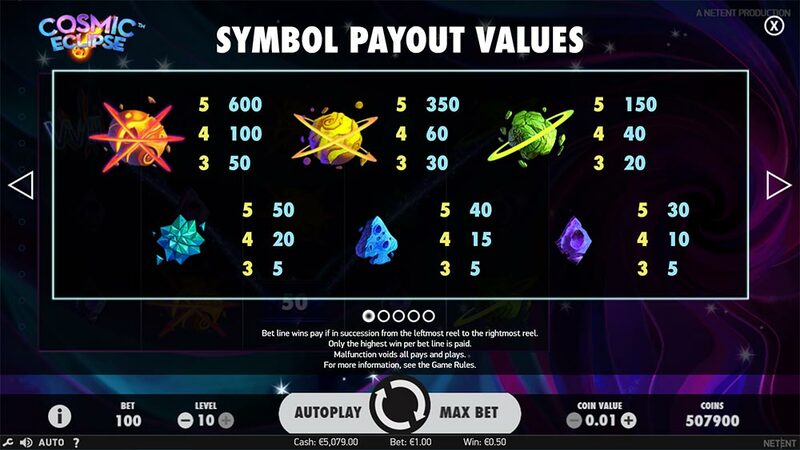 There is a maximum of 15 matching symbols to be collected which would result in a full screen of matching symbols or 10 x 5 of a kind wins. Once no more symbols have been collected or you fill up the meter, the symbols are then placed back on the reels creating a minimum of 1 winning combination and hopefully more! Cosmic Eclipse is a fairly standard slot release from NetEnt, decent enough for an “Exclusive”, but definitely not groundbreaking by any means. 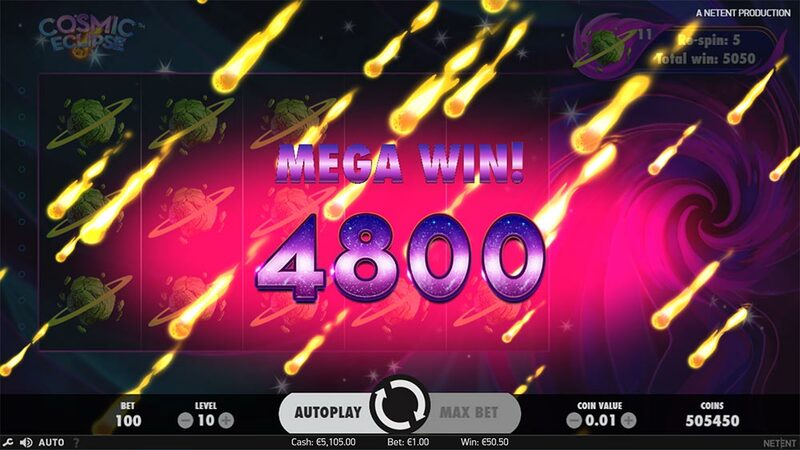 The gameplay is fast-paced but does come with a lot of dead spins in the base game, meaning you are heavily reliant on the Black Hole feature and subsequent re-spins to collect enough of the selected asteroid symbols to produce some big wins. The good news is that it isn’t another Starburst clone in terms of win potential (phew!) 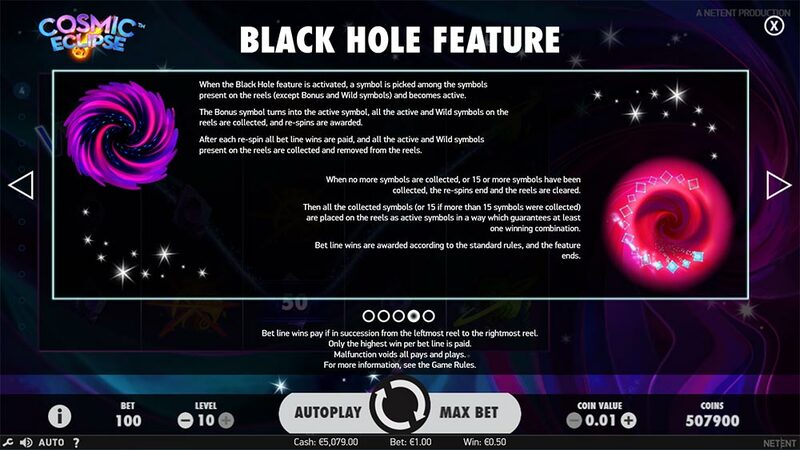 there is definitely some Super Mega Wins lurking on this slot if the higher paying symbols are selected during the Black Hole feature.